Photo by Kaia Miller. 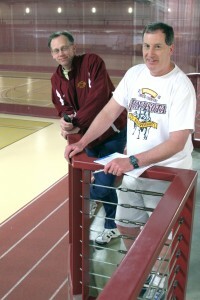 Coaches Garrick Larson (left) and Marv Roeske (right) form a great duo for the Men’s and Women’s Track and Field teams. 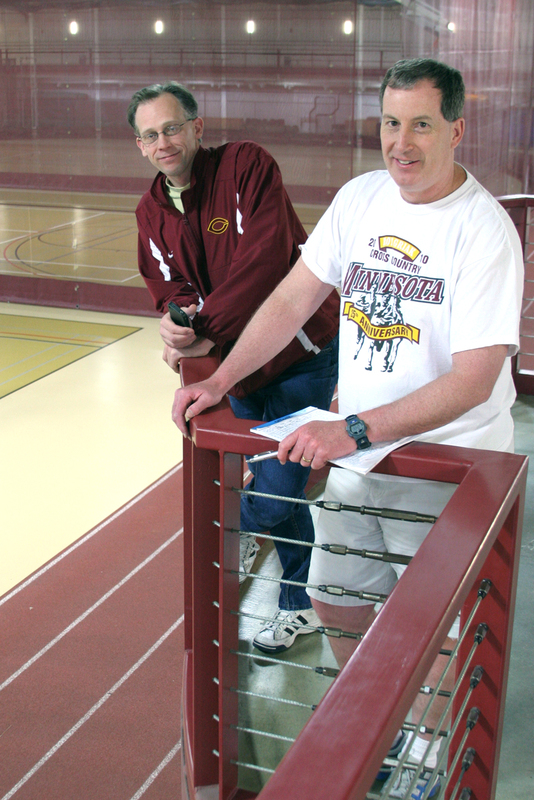 Garrick Larson and Marv Roeske have been working together for over 18 years now as the men’s and women’s cross country and track and field coaches at Concordia College. “That’s almost as long as I’ve known my wife,” Marv said. Some would even joke that this pair is like a married couple themselves. “Marv’s the second best wife I could have,” Garrick said. Starting at Concordia roughly at the same time, they have always worked together as equals, which fortified their relationship from the start. Just like any strong relationship, these two have figured out how to work together to be efficient coaches and keep a lasting friendship. When talking about what Marv’s strengths and weaknesses are, Garrick explained how Marv is organized, competitive and family-oriented, using the analogy of Marv working in a small box with a handful of things that he knows how to do really well. Marv replied that Garrick is a genius track and field nerd and, if he needs to research something, he will ask Garrick first because chances are he already knows the answer. Garrick and Marv explained that whatever one of them doesn’t do, the other one will. For example, Marv usually takes care of setting up all of the hotel reservations and figuring out when they need busses. Garrick normally works with those individuals running the meets. “We’ve been around each other long enough to anticipate what the other is going to do, and we trust each other that things are going to get done,” Marv said. Although this works for the duo ninety-nine percent of the time, Garrick recalls a time when they went to Perkins during a trip, and they both thought the other had paid the bill, only to get back to the hotel and receive a call asking if they were planning to pay for their meal. Of course, silly mishaps are bound to happen when working with someone for so long, but it seems as though nothing could possibly break the friendship between these two coworkers. “We don’t hold grudges,” Garrick said. The two go on to describe their relationship with the athletes of both the men’s and women’s teams. “Really, I’m the women’s assistant coach,” Garrick said. Marv agreed he would be the assistant coach for the men’s team. “One thing that’s been good for our teams is there are some girls who feel more comfortable talking to Garrick and some guys who are more comfortable talking to me. Some coaches might have a problem with that, but not us,” Marv said. This is due to the fact that Marv and Garrick will work exclusively with both male and female athletes on different events. They create relationships with athletes no matter what team they’re from. When asked about the coaches’ relationships with students, Senior Erik Steuck and Junior John Bye from the men’s track team said they are happy with the level of camaraderie seen by coaches and teammates. “They support each other and they put the students first,” Bye and Steuck said. Sophomore Heather Stanton and Freshmen Mariah Lardy and Haylee Hastad from the women’s team all agreed that Garrick pushes everyone to do his or her best and is more of a daredevil, while Marv is more cautious and cares a lot about his athletes. “So they balance each other, and their chemistry brings the boys’ and girls’ teams closer together,” Haylee said. A perfect example of this daredevil versus cautious personality type can be seen in the annual cross country camp trip to Park Rapids. Garrick likes to take athletes out on the lake for some fun tubing time and plans a run to a bridge where the team gets to jump off into the river. Meanwhile, Marv makes sure to tell everyone to be careful when running in wooded areas and checks up on everyone during the week to make sure they are staying healthy. Kaia Miller is a senior majoring in communication studies and multimedia journalism. She came to Concordia planning to major in vocal performance, but after a semester discovered her interests ran in a different direction. With a suggestion from her mom to try communication, she realized her passion for journalism and research. She has held internships at MPR and Prairie Public Radio and hopes to work for a newspaper or radio new station. Kaia is a member of the Concordia Choir, The Concordian and KORD Radio.